I turned my tragic frosted mirror project into a chalkboard. I like it lots better. The nice guys at Lowes cut a piece of wood for me the same size as the old mirror, and then I painted it with chalkboard paint. And I really did make cheeseburgers in a pan, but usually that menu will say, "You're on your own, I'm having microwave popcorn." And here is a new rug I got at Target. Zach dripped pizza sauce on it approximately 26 minutes after I got it home. Which is REALLY awesome. where'd ya get that chair? ﻿Wow, that mirror is a lot bigger than it looked in that last post. I love what you did with it! The chalkboard is a great idea. It looks great! Your rug is amazing! And I'm cyber slapping Zach across the face for dripping pizza sauce on it! New rule, "No eating in the living room Zach!" So did you get the chairs?! And I like that elephants are the new birds, they're so sweet. Merathon - the brown chair is from a local furniture store in Mesa, AZ called Octopus Garden. 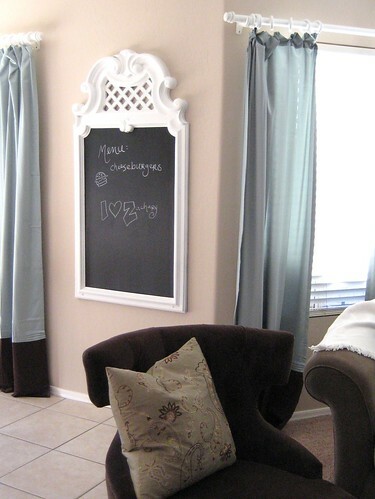 I like the chalkboard much better than the mirror...although the mirror idea was cute. I agree, the chalkboard just looks right. LIES!!! ALL LIES!! Im innocent!!! I'm also a big fan of the chalkboard. It is so huge and chunky. And I'm still laughing at Malia's "cyber slap"! The chalkboard really looks good! 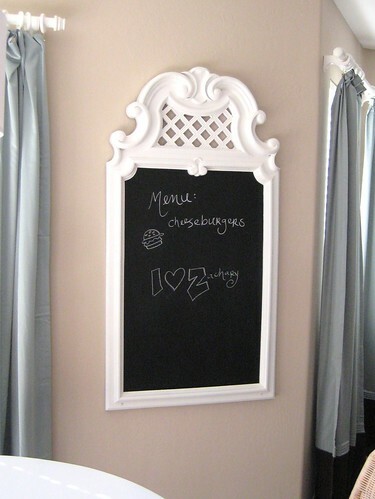 Who would have thought to put a chalkboard inside a fancy frame...it's perfect. That area rug is perfect, it brings out all your furniture...are the drapes in the kitchen new? Your house looks really amazing. You have a great eye for decorating. Get sweet Zachito a TV tray. We have that rug too, love it! 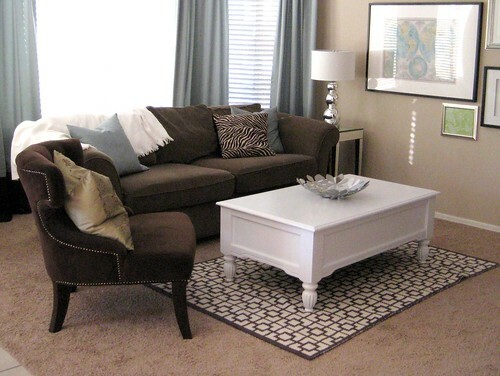 I'm dying to get the glass table for our living room too! Erica, I just happened upon your blog thanks to YHL, and I have to say, I am cracking up right now. First off, your rooms are beautiful, truly. I love your style and I feel like my home looks like yours in so many ways (we actually have some of the same items!) But what is making me laugh is that MY husband is named Zach also, and he also dripped pizza sauce on MY new rug for our living room, and he hates several of my little items (like your flying pig) and he also super annoyed at all of my house switcheroo's :) I think they must be channeling each other, its seriously uncanny. I am definitely adding you to my blog list! I can't wait to see more!